2) Pet parents know to keep all medications (both humans and animal) safely stored but here’s a shocker: snap-top supplement containers can snap open with a little help from a curious cat. I like to take a calcium/magnesium supplement at bedtime and thought it was safe to keep the snap-top container on my night stand. I figured even if my cat knocked it over it would simply roll on the floor. One evening my cat Odin must have heard the jingle of capsules in the bottle and raced over. He knocked the bottle off the table and when it hit the hardwood floor, it snapped open. Several capsules popped out. He sniffed at them hoping they were treats and fortunately didn’t eat them. It may have been a random fluke but it’s food for thought. Coincidentally, pet food treats from Trader Joe’s have a similar snap top container. 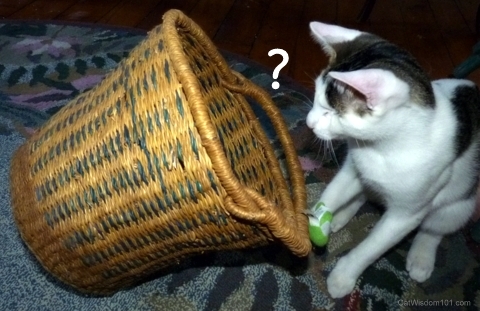 If you have curious kitties who like knocking items off shelves and tables, satisfy their curiosity with safe toys and store all vitamins and supplements as if they were medications. 3) Here’s a new twist to the dangers of ingesting string, yarn, ribbons, thread or dental floss, and it’s irresistibly edible. Those of us who like roasting meat requiring trussing with butcher’s string know how enticing and aromatic juice-soaked string can be to cats. 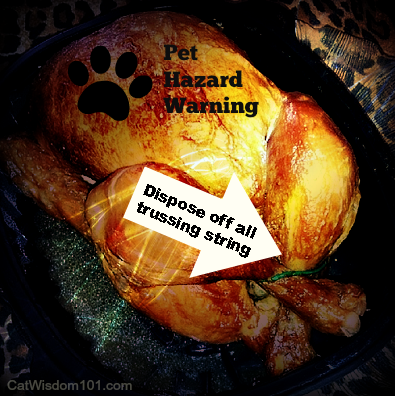 Recently, I bought an organic, ready-made rotisserie chicken and was horrified by the new trussing string. It was a stretchy, green cord resembling a little snake and soaked with tasty, meaty goodness. The combo of visuals with scent and taste would be catnip for any cat. I Instagrammed the chicken with Odin and a warning, and safely stashed the string in the garbage before he could get his paws on it. Ditto with the carcass. 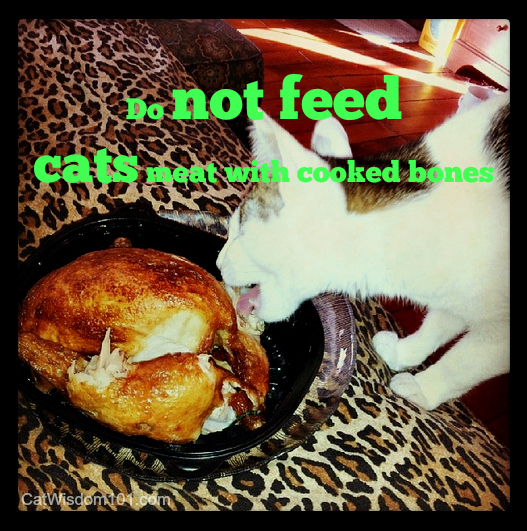 Cooked bones can become brittle causing them to splinter into sharp edges and are known to get stuck in the teeth, causing choking hazards when caught in the throat or cause a puncture of the stomach lining or intestinal tract. Yarn or other linear objects can get twisted around the tongue or once ingested, twisted in the intestines causing a blockage. Cats find yarn irresistible but once they begin swallowing it they can’t stop. We all know how rough and sandpaper-like a cat’s tongue is. This is thanks to tiny hooked barbs on the tongue called papillae, which help cats groom themselves spotless. Those same little barbs prevent swallowed yarn or string from being vomited out. 4) I love to bake and don’t mind giving a smidge of butter, cream cheese, or yogurt as a treat, but beware of raw cookie dough or cake batter. This is one bowl you don’t want your cat to lick clean. It’s hazardous for two reasons. 1 – Raw yeast dough (and that includes pizza dough) can expand and produce gas in the digestive system causing bloat, pain and intestinal issues. 2 – Raw eggs contain a protein called avidin, which causes a depletion of biotin of B1, a necessary vitamin for a healthy coat. Raw eggs also may contain bacteria like Salmonella, which can cause vomiting and diarrhea. 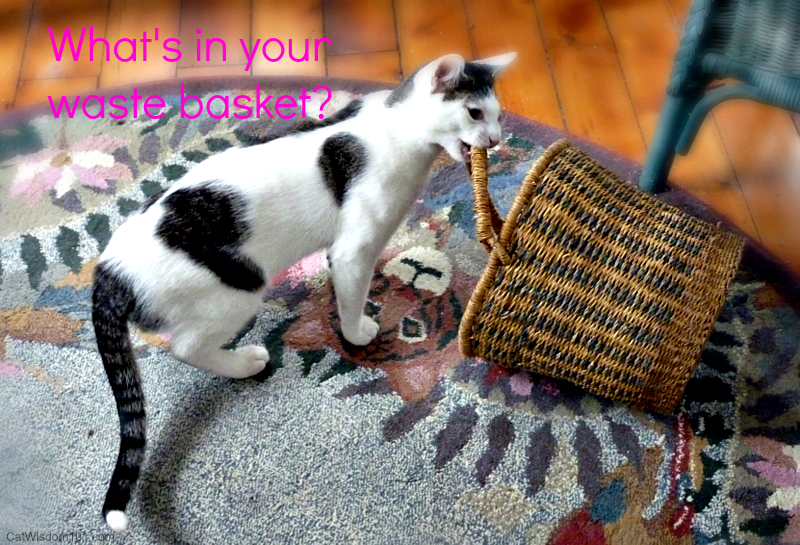 5) What’s in your wastebasket? It’s easy to keep garbage containers in the kitchen covered and away from cats. I use a stainless steel garbage can with a step-on pedal, which lifts and closes the lid tightly. But what about the rest of the house? I did a quick scan and realized there are seven other wastebaskets in my house from bathrooms, dressing room, office, and bedrooms. I like snacking at my desk and now I’m more aware of tossing chocolate wrappers inside. After seeing Odin knock over a wastebasket in the bathroom, and seeing him play hockey with an old lipstick and an empty shampoo bottle, it gave me pause. You’d think with the amount of toys my cats have, they wouldn’t be interested in non-toy items, but there will always be cats who want what’s off-limits. It’s up to us as pet owners to make sure every room in our home is safe. It’s always wise to be prepared for emergencies. Contact your local animal shelter or Red Cross chapter to locate an animal first-aid class near you.